Get two stock sheng pu erh, in this case Menghai's 7542 and 8582, then brew them in gaiwan and drink! On the left is the 8582 and the orange hue says everything. The leaf was brown, the aroma was molasses with some camphor, the soup was sweet tobacco and sandalwood. The 7542 is on the right, the leaf is more olive with stalks, some legume in the aroma, yellow soup with a liquorice finish. The flavour of the 8582 outlasted the 7542 noticeably but even though the 7542 lost it's legs it stick hung onto its huigan. I was really surprised to see just how oxidised and orange the '85 was, seriously processed which is a great shame. Neither tea was particularly outstanding though in any department so I think I'll put them at the bottom of the pile to age. I have much higher hopes for the 7542 though in the years to come. Hmmm.. 6am and I'm wide awake. I'm staring blankly at the ceiling and listening to the cars go by my bedroom, where are all those people going to so early? I live in sleepy Warwick, it's not exactly Time Square. I have seen an opportunity though to have another look at an old friend of mine, the American Hao 901. Under artificial light, with its yellow hue, I unwrap the bing to be met with a rather pungent melon aroma. I bludgeon the cake with my cha dao and remove about five grams of leaf, pop it into my pot and rinse the tea. In the meanwhile I set up my table, fill my iron kettle and sit patiently whilst my induction heater whizzes and whirs itself into a stupor of heat. The rather broken leaf in the pot, no doubt the victim of my attack, releases its notes rather quickly. For all of the floral perfume and ponce of a lot of my other fresh sheng this particular tea stands apart. It's not really a case of bitterness but more of an anise perhaps, as usual I'm stuck for adjectives. There is something so marvellous about being up so early, before the Sun even, and drinking tea. You really can apply your concentration to the moment, it's just so serene. I do miss waking up early in Hong Kong though, taking a walk outside past the legions of old folk performing their morning exercises, some with swords, heading down to a cafe that's already busy despite it being 5am and having a pot of dubious generic tea, not for drinking but to wash your plates with. Anyway, back to the American Hao, it's still under a dark shroud. It's like something is holding back the fireworks. Perhaps I should use a different water? My little session has been interrupted by Michelle, my absence has been noted and joins me by the sofa. With my concentration broken I think I might have some breakfast. Thanks to Adam from The Sip Tip for inspiring me to revisit this tea. This was a surprise, through the post came yet another 2009 sheng sample, something I was suppose to be cutting out as part of my new year resolutions! I can be forgiven though as much as the Royal Mail can be chastised as I ordered this sample at the start of November and they had been ageing the tea for me for almost three months now. The dry leaf was highly aromatic inside the foil packet, perhaps because it had been closed for such a long time. First rinse and as expected with such a fresh sheng pu erh the beanie aroma was strong but not too overpowering, shades of spicy winter apples. The soup is a good clear yellow colour, gladly lacking oranges. Hints of slight smoke in the taste but not unpleasant and good in that it left a tingle on the sides of the tongue. The taste seems to flood the entirety of my mouth, a nice even coating. Evidence of a good early huigan from under the sides of the tongue and I'm enticed to explore further. The taste lingers for some time like a nice floral honey. Quickly I'm into the fourth infusion and things have started to level out with some bitterness taking over the proceedings and I hang about to wait for the sweet after taste. It doesn't rush onto the scene so I take my time to savour it. So often at the fourth infusion mark many teas just become sweet, this tea holds its own still. I've made my mind up, I really like this tea. I feel compelled to order a bing which is unusual for me, I'm often just satisfied with a sample only. How about the price? Oh dear oh dear, pro ported Lao Ban Zhang leaf is never cheap and you never know if you're really getting what you paid for. Hai Lang Hao produces both a 2009 Xin Ban Zhang and Lao Ban Zhang bing at $59 and $73 dollars respectively significantly more expensive than any other tea they produce and almost twice the price of their 2002 Mengku Wild Arbor cake. My conundrum is this, should I spend over $70 on this 2009 tea when I could spend about $100 on 2005 Lao Ban Zhang from Nada whose opinion I trust on the real quality of a tea more than my own? There is something 'fun' about betting and many a gambler will tell you that its a perilous road to travel down. I may well just take a punt on this tea but being a sensible gambler I will have a flutter on Nada's 2005 Lao Ban Zhang first. I've had a bit of bad luck recently with having, not one, but two glass kettles crack on me. Although being supposedly made for induction heaters and that my own induction heater being rather tame in nature both lasted no longer than a couple of weeks. Having a quantity of water pour out upon an electric stove is no joke either. Lesson learnt, don't buy glassware like that from China. So, plan B, I was walking by my local tea shop here in Warwick and I thought to myself, why not buy an iron pot? I had a little look at what was on offer and this particular one appealed to me despite looking like a over engineered iron frisbee! The design itself does have a drawback as if you fill it up too much the boiling water tends to leap for freedom out of the spout but it has character and I like that. Compared to my glass kettles the iron holds heat a lot better and I am able reduce the amount of times I need to reboil the water during a session. Let's hope I don't break this one. I bought a sample of this tea at the same time as the Yiwu Gao Shan I reviewed a little while ago and this morning upon rising I finally got around to trying it, call it a pre breakfast treat. The yixing holding the freshly brewed leaf released it's vapours of light tobacco, honey and something most like brambles. It doesn't fill the nose too quickly and allows for deep inhalations. A quick look through the open lid and the leaves seem very solid with immensely thick stalks, something I recall from the Gao Shan, which is unsurprising since they are picked by the same minority. Perhaps the material collected is from the exact same source but with this tea being picked in the fall. The soup itself though holds no surprises, it's characteristics go hand in hand with the aroma. It's sweet like honey with mild tobacco, lightly floral. It doesn't take long for me to desire more from my early morning tea kick so I increase the duration of each steep considerably but it seems that it's nearly impossible push the five grams of leaf too far. Yet again I'm faced with a tea whose leaf really looks the business but falls short in potency, it's such a shame. Having said that, it's a really inexpensive tea coming in at about £22 per bing. Sometimes you can be pleasantly surprised by a budget tea, often though it's just a fair reflection of the price. I couldn't make my mind up for a fifth place so I'll leave it like that. The '99 7542 is just what I like, a great balance of age with an enduring sweet huigan. I admit it's not an exotic choice of tea, it's a 7542, it's like a gun fanatic awarding his favourite pistol of all time to the Colt 45. But I like what I like! A while back I did a post on my second dabbling into brewing kombucha. 5. Stick it in the fridge for a few days and you have a lightly fizzy, tart beverage that has more healthy bacteria than an entire Tescos full of Yakult. ....cheap to make if you stick to the usual PGTips tea bags and white sugar. Unfortunately, being a complete idiot, I decided to 'up the spec'. What you see in the picture above is today's batches, the one on the right is made using a Dong Ding Oolong base. The one of the left goes further, it's made from a Da Hong Pao or Big Red Robe yancha base with a soft brown sugar as a bit of an experiment. The 'scoby' or bacteria thingy for the Da Hong Pao also has an experimental history since it's last brew was made from honey and water with no tea at all (it's suppose to be champagne like). If the Red Robe doesn't work it doesn't matter too much, without pushing the limits a bit you'll never learn! In the past I've made kombucha from Dragon Well and Mao Feng green teas with much success. My pu erh brewing experiment with a 2007 Bu Lang was an unmitigated disaster and became moldy thus forcing me to bin it, scoby and all. 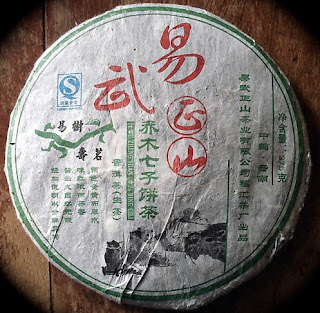 Stop buying sheng pu erh that is less than one year old! I just don't enjoy it enough. I've got plenty in my tea cupboard and I certainly don't need anymore. This is the third fresh sheng sample I have received from Yunnan Sourcing following my desire to compare my notes with those from other tea blogs. Let's cut to the chase and see what I have found. The sample seemed to be of a reasonably tight compression and required some slightly heavy handed cha dao action to remove a 5g amount for brewing. The first thing that struck me about this tea was that the soup was rather darker than I expected for a 2009 pu erh. I wasn't going to take any pictures of this session but I was suddenly compelled to, with the picture above coming from the first infusion. I didn't think that I steeped the pot for too long, perhaps this tea is not too forgiving? The first couple of infusions came out quite thick too, sweet and with a swift fragrant huigan after taste. I backed off the steeping time third time around but the result wasn't a great success, the colour was more what I thought it should of been but the tea was clearly under brewed in it's taste. I am really struggling to get this tea brewed to my liking. On my fourth attempt I starting to get the hang of it. There is still remains of the milky thickness in the soup, the sweetness is starting to depart and there is some astringency. Again though, for the second tea review in a row I am not feeling very inspired. There is little that compels me to purchase more and I am wondering when I will return for a second thought.